This is a sponsored post written by me on behalf of Gorilla Tape for IZEA. All opinions are 100% mine. 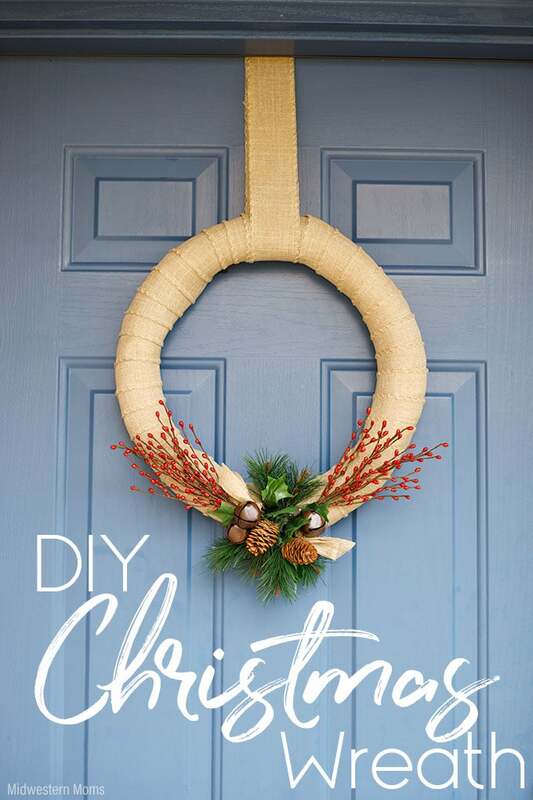 A simple DIY Christmas Wreath that is made from a pool noodle! 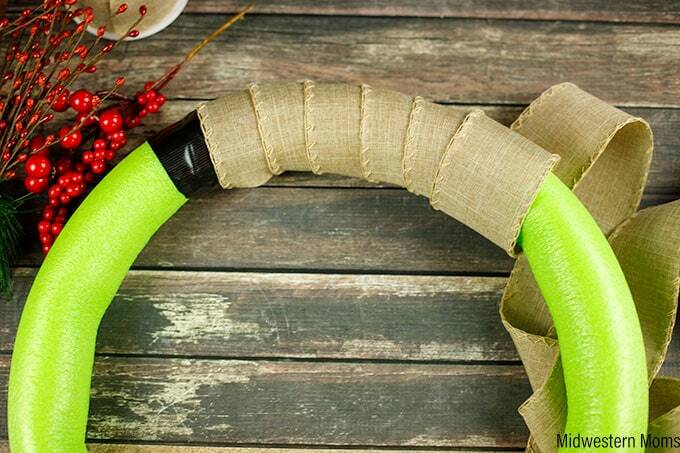 The pool noodle makes a great wreath form for cheap! I had purchased a couple of pool noodles thinking that I would use them to help make a pumpkin costume. Well, it didn’t work out. So I have a couple of pool noodles just sitting around. Of course, the boys love playing with them but I wanted to make something with at least one of them. I decided I wanted a new Christmas themed wreath to hang on the door. Why spend the money on a wreath form, when I already have a pool noodle! I ran to Home Depot and grabbed some Gorilla Tape. This is crucial for making making the form. 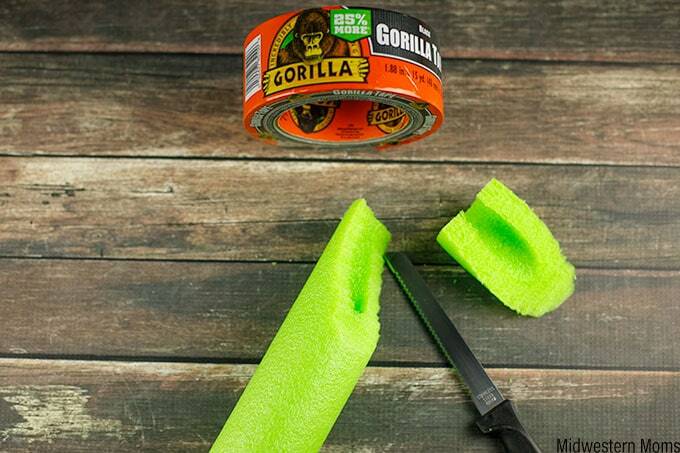 Gorilla Tape is 3 times as strong as regular duct tape! It is also rugged, weather-resistant Shell: Withstands moisture, UV rays, and temperature changes (very important when you live in Missouri!). Ribbon – Make sure it is not transparent, or else you will see the pool noodle color through the ribbon. Christmas themed decorations for your wreath – I got mine from a craft store. Gorilla Hot Glue Sticks – They have 5x the holding power!! Perfect for this job! Instructions: 1. 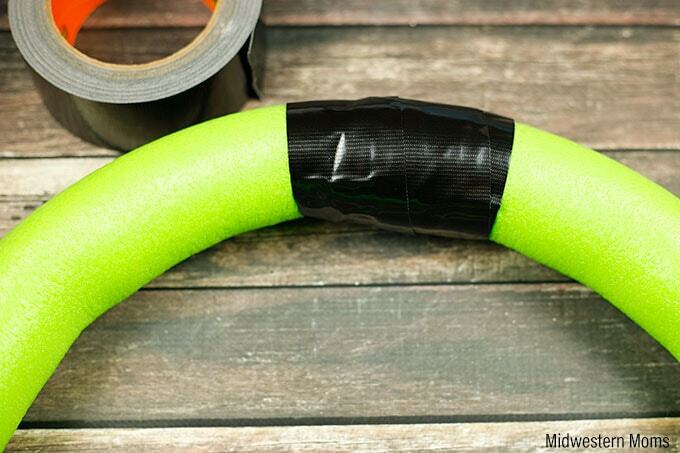 Start by cutting an angle at the ends of the pool noodle. Cut one side first, then match them up to see how to cut the other side. You want them to lay flat together to make a circle. 2. This is where you need a second set of hands. Have someone hold the pool noodle into a circle shape. While they hold it together, take the Gorilla Tape and wind it several times around the area where the pool noodle joins together. Another reason that Gorilla Tape is perfect for this job: it has double-thick adhesive. Which means it grips smooth, rough and uneven surfaces. Perfect for the surface of a pool noodle. 3. Start wrapping your ribbon around the pool noodle. Try to make it as consistent as possible. 4. 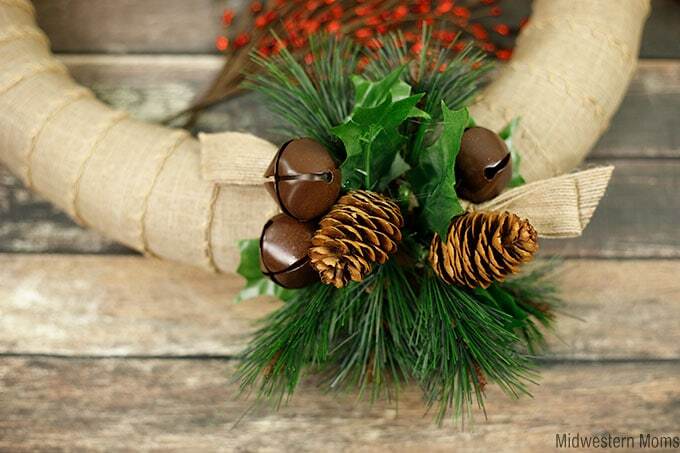 Use the leftover ribbon to make a big loop to hang it on the door. 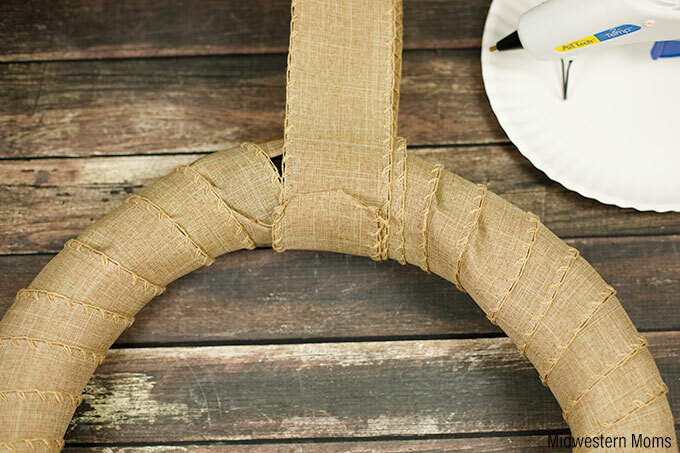 Secure the ribbon with hot glue. This also helps hide where the ribbon comes together. 5. Start attaching your Christmas decorations to the front of the wreath. I just picked up a couple of things from the craft store to add to the wreath. Also, I used a lot of hot glue for this part. I wanted to make sure the decorations didn’t fall off. 6. 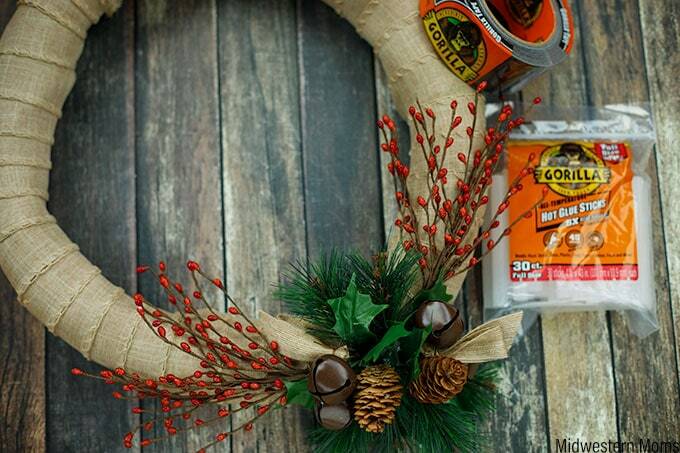 Allow the all the hot glue to fully dry before hanging the wreath. You don’t want your pretty decorations falling off. Also, make sure you get all the hot glue strings pulled off. 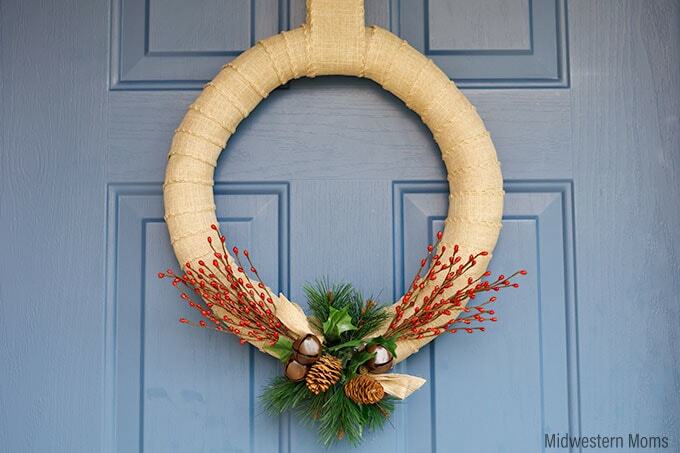 If you have a wooden door, you could use a flat-topped tack to keep your wreath on the door. If you are like us and have a metal door, I used painter’s tape to adhere it to the top of the door. This way, I knew the paint would stay on the door. However, I am not sure how long the painter’s tape will keep the wreath up. A better option, if you are brave, is to use Gorilla Tape. It would be strong enough. Use at your own discretion. That is amazing,beautiful and so easy! I am inspired! A great idea! I assume the size of the circle can be adjusted. Really cute and looks easy to make. 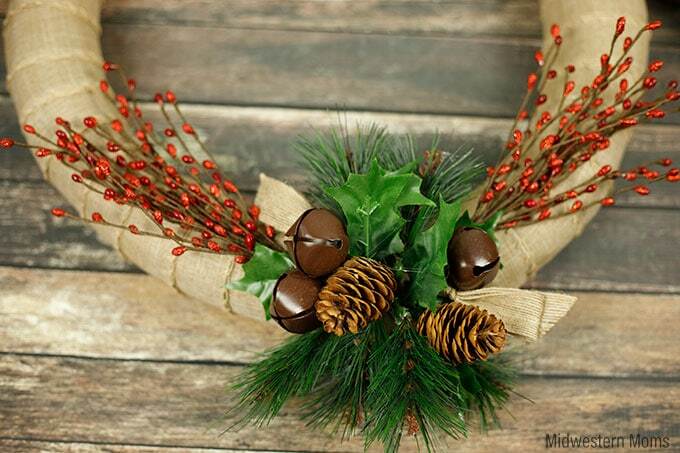 You can make these for different seasons. Thank you for the great idea.